Is It Wrong That I Love Chubby? 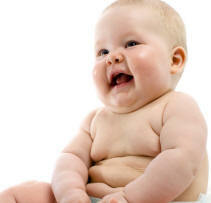 There is nothing yummier than layers upon layers of baby rolls and folds and dimples and crevices and roly-poly bellies and plump thighs and rotund cheeks and quadruple tubby chins. Utterly, edible. It’s an obsession I have had since I was a young skinny lass. My family knows too well that if there is a young chubbo in the room, I am a goner. 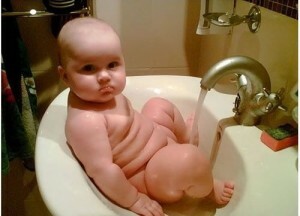 They roll their eyes and say, “Here we go…a chubby baby”. I cannot help myself. My legs go weak and buckle, my eyes go bug-eye, my tongue dangles lifeless over my chin, I gasp for air, my voice goes up 130 decibels…well, I think you get the picture now. They are just so damn irressistable. Take a look at this chubster. Who needs a bidet anyway? It’s not just chubby babies that I adore. 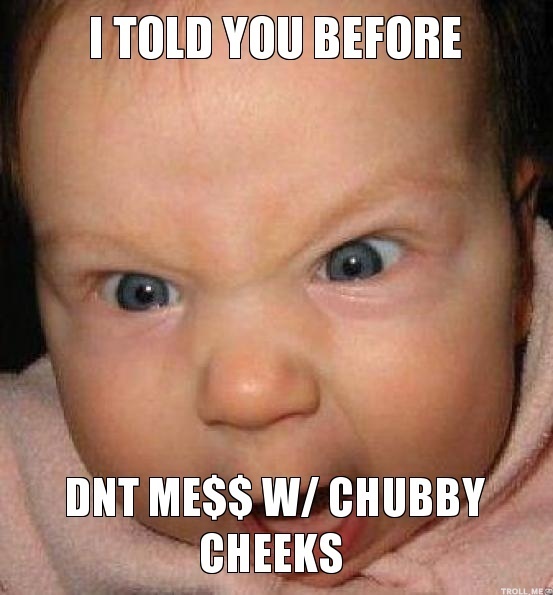 I will also kill for chubby toddlers. 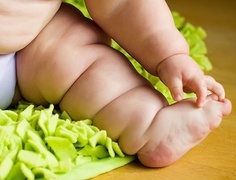 They are everything adorable chubby babies are except for now, those rolls, folds & crevice-infested beings, move around and talk! Me muero! Imagine my surprise and delight when a little super chubby 4/5 year old boy approaches me at Target yesterday. I almost peed a lot a little. Except that this precious ball of chubbiness was alone and he was crying! I scrouched down to his level and asked him what was wrong. Tub-tub: I can’t find my family (whimper, whimper). Me: (holding back the urge to squeeze him) Oh, honey it’s ok, I’ll help you find your family. Don’t you worry. Tub-tub: Maybe they went to the mall without me (whimper, sniff, whimper). Me: Oh no honey, I am sure they are looking for you right now. I know that your mommy and daddy told you not to talk to or go with strangers so I am not going to hold your hand (even though I want to stuff you in my cart and take you home) but I want you to hold the cart and we will go together to the customer service desk to find your family. Me: Oh no, they wouldn’t get food without you. What’s your name sweetie? Target Lady: Will Shelley please report to the courtesy desk, Shelley. I spot a “Shelley” and an older brother running towards us pushing their cart. Shelley: Oh honey, you knew just where to go so that I would find you! Me: Ehh…actually I brought him here (had it taken you two more minutes to get your *ss here, he would have been MY Oscar). Shelley: Oh, thank you and I’m sorry. Oscar, it’s ok. You drifted off to the toy aisle and we couldn’t find you. Big Brother: Why did you leave to look at toys, stupid? Don’t ever leave me alone again, that made me very sad!!! I love me some chubby Oscar.